Plantains look like bananas but are a lot starchier; they’re also rich in vitamins (especially A and C), potassium, and fiber, and can be eaten either green, semi-ripe, or fully ripe. Green plantains are usually cooked and eaten like potatoes—as in these fries. They need to be soaked in salt water first to make their clingy skins easier to peel. The recipe is from Isabel Cruz, chef and owner of Isabel Pearl, in Portland, and Coffee Cup Café and Isabel’s Cantina, both in the San Diego area. Cruz is also the author of The Latin Table: Easy, Flavorful Recipes from Mexico, Puerto Rico, and Beyond (Skyhorse Publishing, 2018). Cut tops and bottoms off plantains and score skin vertically along entire length of plantain, scoring 3 or 4 times and being careful not to cut fruit underneath. Soak plantains in warm salted water at least 20 minutes and up to an hour. Peel skins off in strips. Meanwhile, pour enough oil into a large pot to come 2 in. up the sides. Insert a deep-fry thermometer and heat over medium-high heat until oil registers 380°. Preheat oven to 200°. While oil is heating, slice plantains: Blot them dry with paper towels, then cut each in half crosswise. Halve those pieces lengthwise, then slice into 1/2- by 1/4-in. strips. Frying in small batches (about 6 batches total), ease plantains into oil. Cook, ­stirring occasionally, until golden and slightly crisp on edges but not too brown, 3 to 4 minutes per batch, letting oil return to 380° between batches. Lift each batch as done to a paper towel–lined baking sheet. Immediately season well with salt, tossing gently to coat, and keep warm in oven as you fry the rest. 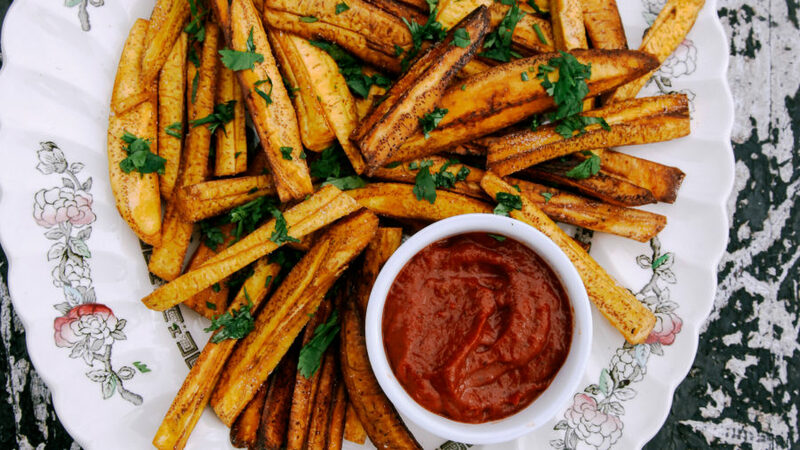 Pile plantain fries on a platter, sprinkle with cilantro, and serve with Chino ­Latino Ketchup and Lime Crema. Наш важный портал на тематику гидроизоляционные материалы для фундамента.